When I was a kid, my mom didn’t rush us to the doctor every time we got a cold. Colds were something you just had to get through. And we didn’t have a medicine cabinet full of over-the-counter relief for coughs and colds, either. We had vapor rub. That and cup of hot tea gave us the relief we needed. Does it seem to you that our approach to common ailments has become a bit complicated? Have you taken a good look at the cough and cold remedy aisle in your local pharmacy lately? That little blue jar of mentholated salve was all we needed back then. Some of the ingredients are not what I prefer to use these days, but the same relief can be found in a salve you can make yourself. Don’t know where to purchase some of the ingredients? All of them may be found at Starwest Botanicals or Frontier, two companies I trust for quality herbs. Find organic essential oils here, and beeswax here. And if you like the idea of simple, safe ingredients, but would rather not make it yourself, Celeste from Simple Gifts Farm will make it for you! How’s that for simple relief? Simple Gifts Farm is a certified organic vegetable farm in Washington state, and during the winter they create their own natural body care products. 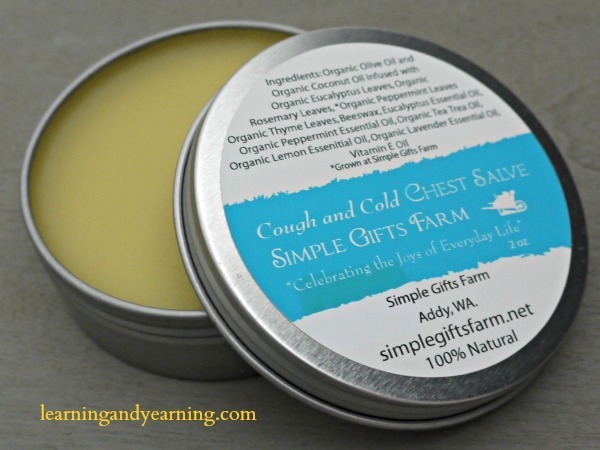 Cough and Cold Chest Salve, Baby Balm, Gardener’s Hand Salve, and more! 1. Place the herbs in a quart jar. 2. Add enough organic olive oil to completely cover the herbs. 3. Let herbs infuse in oil for 3-4 weeks. This is the preferred method but for a faster infusion, gently heat your oil and herbs by placing jar into a pot of water and heating on the stove. 4. After oil is infused strain out herbs using a strainer lined with muslin. Squeeze out as much oil as you can. 5. Heat infused oil and beeswax together in a double boiler until wax is melted. Remove from heat. 6. Add vitamin E oil and essential oils. Stir. 7. Pour into a small jar and allow to cool. This makes approximately 2 oz. of cough and cold chest salve. Hi Deb, You’ll have to contact Simple Gifts Farm, who I reference above. They were kind enough to share this recipe with me, and are the ones who make the baby balm. 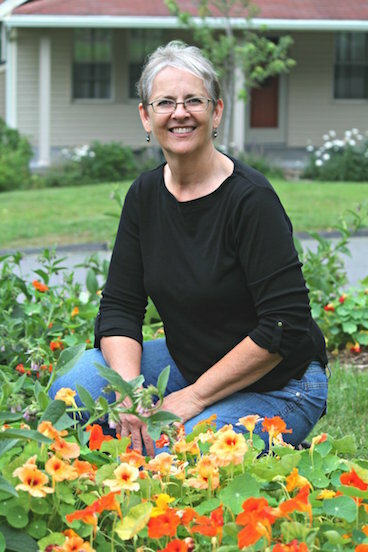 This is Celeste of Simple Gifts Farm. Send me an email(visit our website and click contact us) and I would be glad to share the recipe for the baby balm. It uses a similar method to my cough and cold salve. What a great idea to add Vitamin E oil – I wouldn’t have thought to add it to a chest salve but a wonderful addition it is. Thanks! I have kids 8 and under and would love to be able to use a natural cough and cold salve on them (I live in Kenya and my essential oil blend for coughs and colds just ran out!). Any advice on how you could make the salve recipe you posted safe for use on smaller kids? Thanks! What oils were in your blend? Can you get those individually where you are? It was a ready made blend from Young Living essential oils called RC. Worked wonders. My mom mixed (a pint of ) whiskey, honey, lemon (sliced) & rock candy (now they come on a stick, back then they came on a string, it’s basically crystallized sugar on a string). She added the first 2 ingreds to the whiskey and then dangled the rock candy on it’s string from the neck of the bottle. Once the candy was dissolved, it was ready for use. She mixed a tsp of that concoction to a cup of hot tea and then we wore mustard packs on our chest & vicks salve on our feet (covered up by a pair of daddys wool socks). I swear upon all that’s good…our symptoms would be gone by the next day. So, how could one make this salve without breaking the bank? I looked up the Lavender essential oil and it was $5.95. Assuming all of them are $5.95, that would be a steep price to pay on top of what the cost of buying all the herbs too. And the Organic Organic Olive oil. and the S & H. How could one make this cheaply, to use on 6 kids (10-16 y/o). Hi Anna, sounds like your mom was a pretty smart woman! I know that a lot of my readers already have a stash of essential oils on hand. I agree – if you need to buy all the ingredients, it can get pretty pricey. Have you considered purchasing the the balm already made up from Simple Gifts Farm? I know she uses quality ingredients. 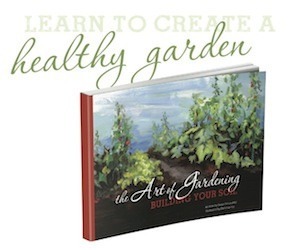 Thank you for sharing this with us, I can’t wait to give it a try. Amazon sells these: http://amzn.to/1WicW1w. Thanks for stopping by, Erlinda!